Knocking up the nanny wasn’t part of the plan. I’m supposed to look like the perfect father. So my ex’s lawyers stay away. Actor, billionaire, single dad to three. I’m sleeping with the nanny. Her lips call to me, her hips sway, and I’m falling. Especially once we find out she’s pregnant. But my ex has other plans. She’s threatening to take away my children. Now I have seven to protect. And nothing will stand in my way. 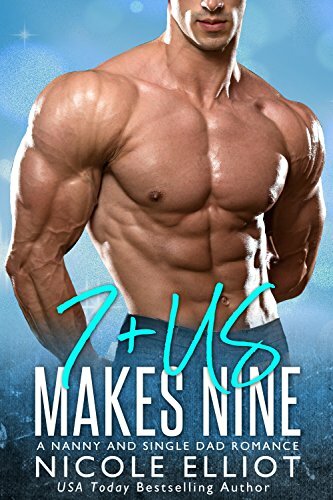 7+Us is a super steamy secret baby romance. It has a HEA and NO Cliffhanger. It is a STANDALONE. This is the final book in the series. Enjoy! Catherine, an early education teacher, agrees to nanny for Jace, single dad and former leading actor, after some changes in her life. As the story progresses the reader gets drawn into their lives, and the choices that are forced to be made for the good of all. A nice single dad surprise baby that gives you a HEA to be proud of. Jace Logan father of three is trying to protect his children from their mother and his ex-wife Anya. Anya was a famous actress, but now she is addicted to pills, alcohol and drugs. Jace also has a problem, his nanny of six years is retiring and now he needs to fine a new one. Catherine Faust a teacher just lost her job and decided to be a nanny, that’s when her friend told her about Jace Logan needing to find a nanny for his three children. After some thought, Catherine call to make an appointment with Jace and got the job as the live in nanny. To her surprise and also Jace, the children took to her very well, even the youngest child, Michaela, who doesn’t take to strangers very well. From the first time at the interview Jace and Catherine where attached to each other and wanted to keep it professional because of the children. Anya the ex-wife is causing trouble, saying she is getting her children back, but she has no desire to stay clean. As Anya continues to cause trouble, Jace and Catherine become lovers and several months later Catherine find herself pregnant with Jace child. Now Jace and Catherine want to keep it from everyone even Anya. I have read several book by Nicole Elliot and every one is very entertaining. They are also well written, great characters and storyline that keeps you reading to the end. I am volunteering to leave a review for a ARC of this book. Catherine works as a teacher for a private school. A parent hit on her and the wife made it her fault so the school let her go. While at lunch with a friend, the friend mention a banning position the was a available. It was for Jace Logan. An actor turned theater owner. His Nanny is retiring and he needs a replacement. He has been raising the kids on his own since his divorce. His ex, also another actor, got into drugs and parting. He hired Catherine right away. They kids take to get easily. When the sexual tension gets to, they start a relationship. She gets pregnant unexpectedly. When she finds out she’s pregnant is also when the ex tries to come take the kids. It’s a hard time for Catherine hiding the pregnancy from everyone. Will they make it through the man’s drama? I loved this book. I loved the whole series. There was love, suspence, and drama. I can’t wait to see what she comes out with next. I received an ARC copy for my honest opinion. Catherine has had it at the private school where she works. She filed a complaint against a parent who was a little too touchy-feely. So, she gets fired because he is a large donor. When she gets an opportunity to be a nanny to three kids that she can teach and nurture, she takes the job. Jace is a former actor that owns a theatre, has the three kids and a drug addicted and alcoholic actress ex-Wife who wants her custody rights restored. It’s not Long before they act on their mutual attraction to each other. While they get closer, the ex is harassing them and holding press conferences to plead her case for custody. In between all of this mess, Catherine finds out she is pregnant with quads. Nicely written and enjoyable read.